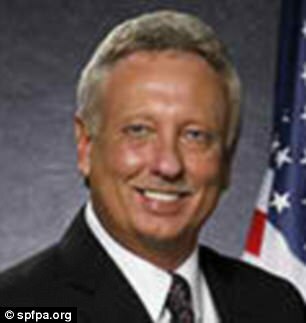 In a Daily Mail exclusive, the British media outlet is confirming what Powdered Wig reported yesterday regarding Ellen Degeneres’ marshmallow soft interview of Jesus Campos, the Mandalay Bay security guard who was the first victim of madman mass murderer Stephen Paddock. Honesty is not what we got from Degeneres or Campos. 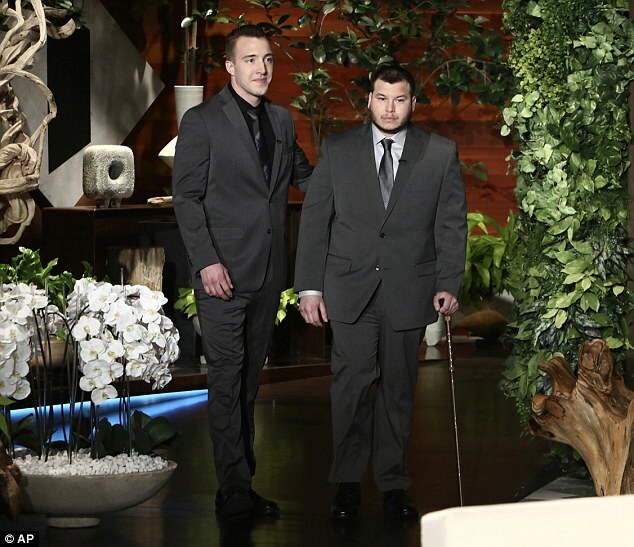 Degeneres asked nary one tough question and Campos revealed nary one new detail, leaving us with only the same unanswered questions, plus raising a few new ones. The next thing he knew the security official had bailed on the five interviews. Then he learned on Monday that instead of appearing on a news show he would go on Ellen. MGM has not returned requests for comment. 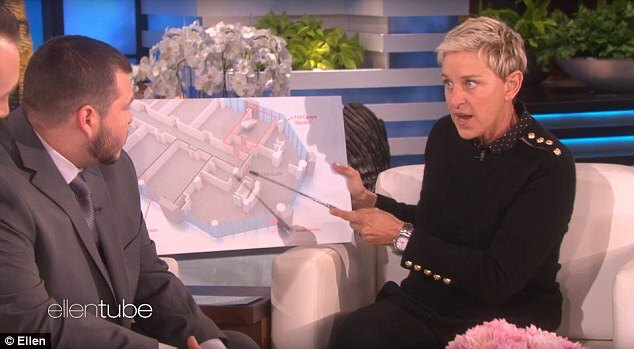 Since Wednesday’s show, DeGeneres has been attacked for failing to ask Campos any incisive questions about the timeline of the shooting. 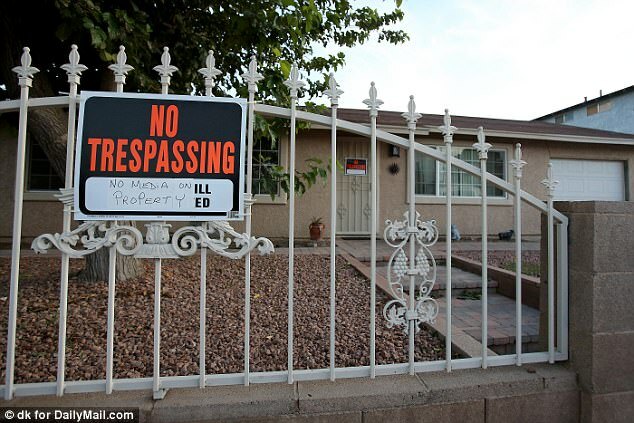 Clark County Sheriff Joe Lombardo has given three different versions of the events since the October 1 massacre. 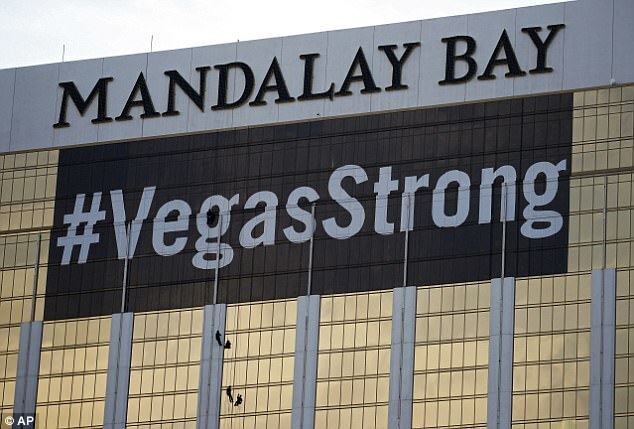 Instead of asking Campos and fellow hotel worker Steven Schuck about how the deadly event unfolded, DeGeneres talked instead about their favorite pro football teams and gave a shout-out to a company that had promised Campos a season ticket to the Raiders when the team moves to Las Vegas in 2019 or 2020. 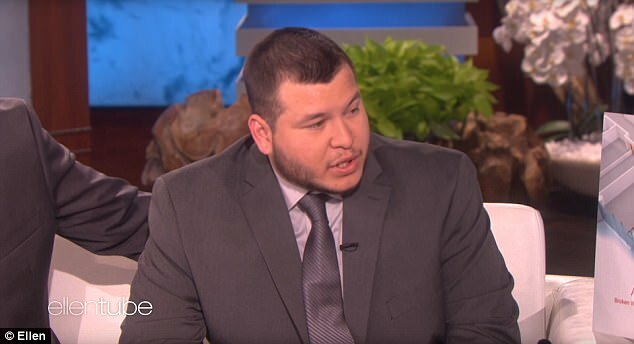 During the interview, DeGeneres, 59, explained that Campos had decided to do just the one interview because he doesn’t want to ‘relive’ the shooting. When he went through his recollection of the night, she did not press him to clarify some of the lingering questions about the official timeline — such as whether he or hotel officials delayed calling police for six minutes after he was shot. According to Lombardo’s first timeline, Campos was shot by Paddock after he stopped firing at the music festival across the street. MGM, took issue with police when they revised the timeline last week — saying that Campos was shot before Paddock started shooting at the music festival, but that six minutes passed before police were first alerted to the shooting — insinuating that either Campos or the hotel delayed calling police. Police revised the timeline again last Friday, saying that Campos was shot at 10:05pm and immediately called in, just as Paddock started firing at the festival below. On Ellen, Campos explained that he was first sent to the 32nd floor because of a stairwell door that wasn’t opening. He arrived via the stairs and found that the door wouldn’t budge. So he went back down to the 31st floor and rode the elevator up to the 32nd floor, where he saw that the door had been secured shut with a metal brace. Campos said he heard ‘drilling’ sounds, so he thought a maintenance team might be working on a project. 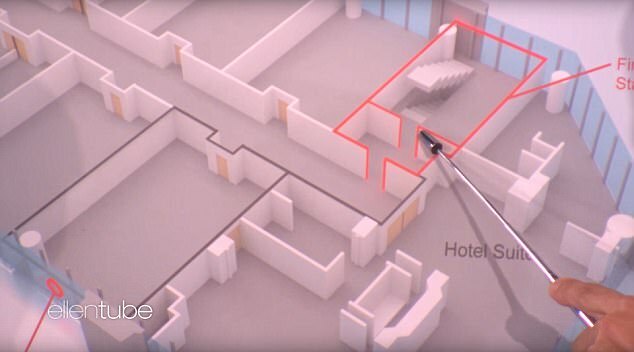 After calling the issue into maintenance, Campos started walking down the hall away from the door when he says Paddock started shooting at him through the door of his suite, number 32-135, located just to the right of the stairwell door. While that recollection lines up with the newest timeline, Ellen didn’t ask him anything about the prior conflicting timelines. Police believe Paddock was tipped off to Campos’s arrival due to security cameras the gunman had rigged in the hallway. They say he fired 200 gunshots through the door at Campos before opening fire at the Route 91 Harvest country music festival across the street. He had broken two windows in the suite to get his shots off at the crowd below. As Campos took cover, maintenance worker Stephen Schuck arrived on the floor to see about the door issue. 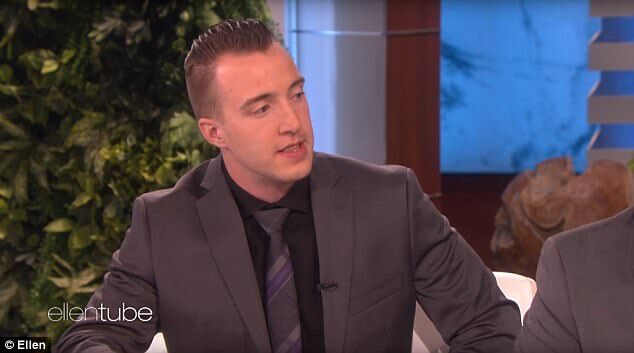 Schuck, 22, accompanied Campos on Ellen and credits the security guard with saving his life. ‘Jesus, he leaned out and he said “take cover, take cover!” and yelled at me and within milliseconds…if he didn’t say that I would have got hit,’ Schuck said. Campos also said he saved another life amid the chaos. As Paddock was shooting, a guest came out of her room and he said he yelled at her to get back in. During the interview, Campos appeared shy and quiet. DeGeneres told him: ‘I know you’ve had so many people asking for you to tell the story and talk about it and I understand your reluctance. You’re talking about it now and you’re not going to talk about it again. 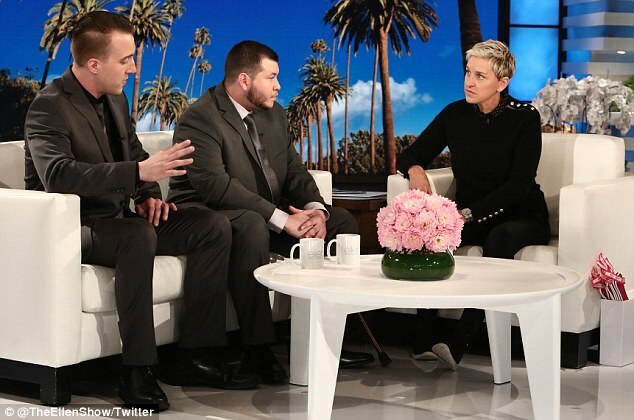 Ellen said she invited him on her show because she ‘wanted to celebrate’ Campos’ heroism. ‘It’s helpful for people to understand what a hero you are because you being shot in the leg saved so many people’s lives. Instead of you getting out of there, you saved Stephen’s life and that woman’s life,’ she said. 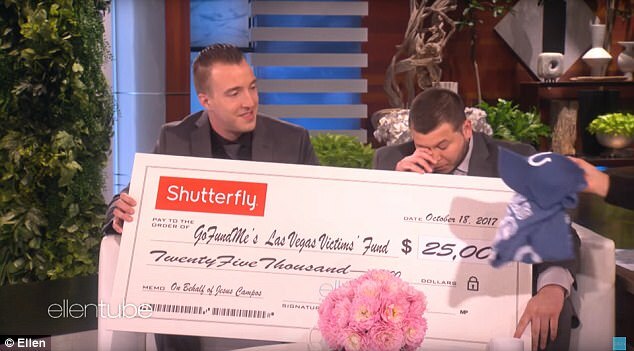 At the end of the interview, Ellen said that both Campos and Schuck had turned down her offers of money, so instead, Shutterfly, a sponsor of the show, was donating $25,000 to the Las Vegas Victim’s Fund on their behalf. When she presented the two with a large check, Campos began to tear up. 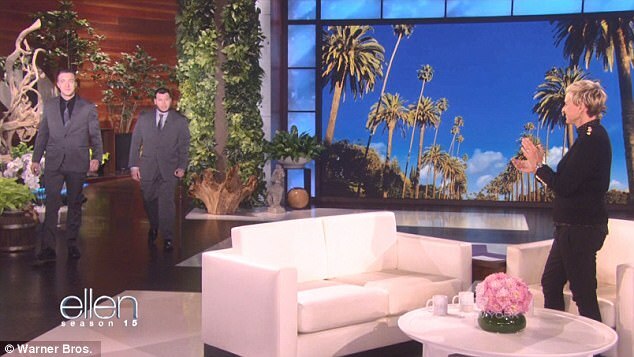 DeGeneres made sure that the two didn’t leave empty handed. The NFL offered to fly Schuck out to see his favorite team, the Indianapolis Colts, while Shutterfly is paying for Campos’ season tickets when the Raiders move to Las Vegas. As the interview was wrapping up, Campos took a moment to thank the people who came together and helped end the shooting and who tended to victims. ‘Everyone came together to help that night even in the darkest hour,’ he said. This is the original timeline of events given out by police. 10:05pm: Paddock fires his first shots on the crowd, as seen on CCTV. 10:12pm: First two officers arrive on the 31st floor and announce gunfire is coming from directly above them. 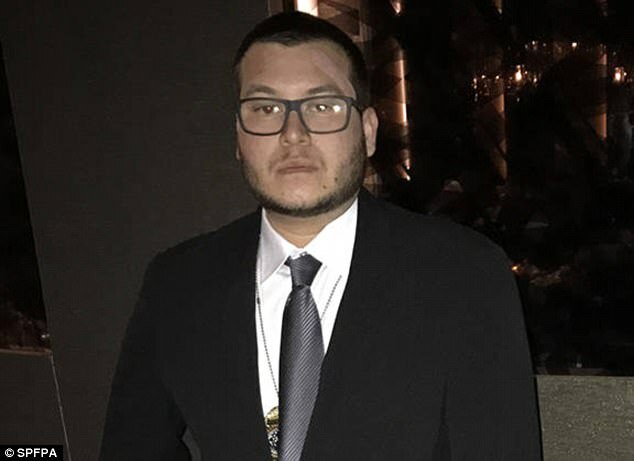 10:14pm: Guard Jesus Campos approaches Paddock’s room and is shot, but only injured. 10:15pm: The last shots are fired from the suspect, per bodycam, due to Campos’ intervention. 10:17pm: The first two officers arrive on the 32nd floor from the 31st. 10:18pm: Campos tells the cops he was shot and gives them the exact location of the suspect’s room. 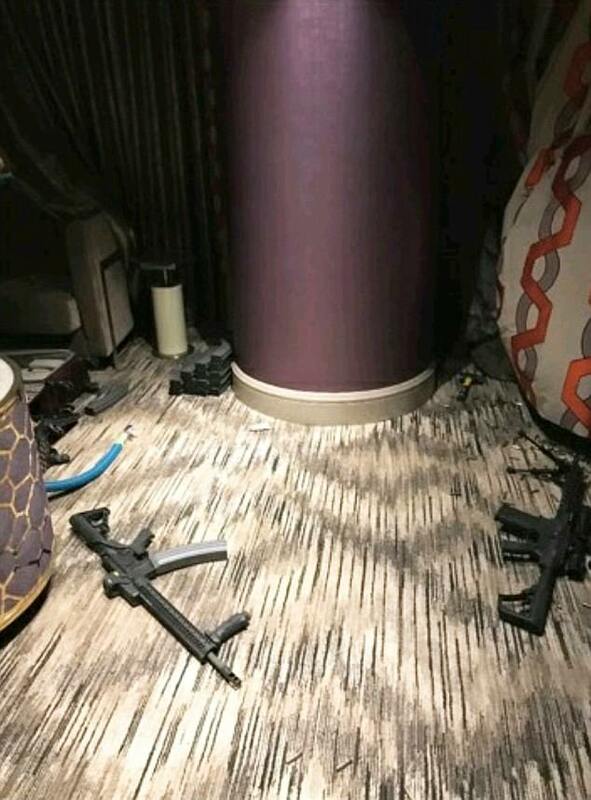 10:26-10:30pm: With Paddock quiet, eight additional cops arrive and they decide to evacuate the rooms on the floor. 10:55pm: Eight officers arrive in the stairwell next to the suspect’s room and find the door tampered with and a camera on a room service cart outside; they decide to hold off. 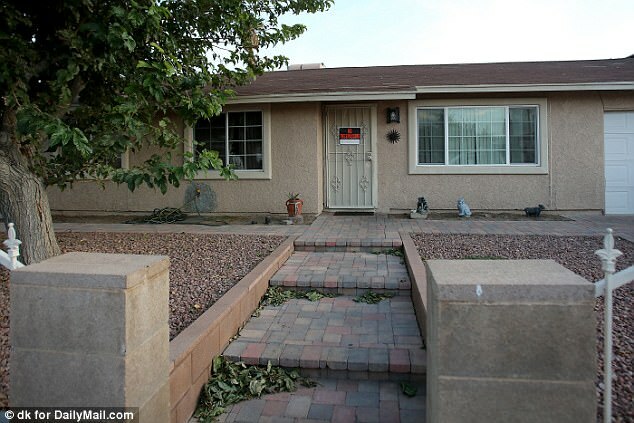 11:20pm: Paddock’s room is breached and police enter the room to find him dead. 10:05pm: First shots fired by suspect. 10:12pm: First two officers arrive on the 31st floor. 10:15pm: The last shots are fired from the suspect for reasons unknown. 10:18pm: Campos, who has been stricken for almost 20 minutes, tells police about Paddock’s room. 10:26-10:30pm: With Paddock quiet, eight more cops arrive and they decide to evacuate the rooms on the floor. 9:59pm: Campos approaches Paddock’s room looking for an alarm going off at a door nearby – likely from the stairwell. He encounters a barricaded door and makes his way to 32nd floor. 10:05pm: Campos is shot and wounded in the leg. He radios and calls in incident as gunman opens fire on concert.